3. The St. Gerard statue (and votive candle) in the living room. 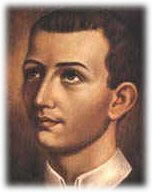 St. Gerard was “The Man”, the family guardian. Every year Dad faithfully walked the feast parade route with the Saint, as burly men carried the statue on their shoulders. Dad and others helped guard the money lovingly pinned to it. When I bought my house, one of the first things he did was give me a St. Gerard statue. Besides his regular daytime job, Dad was a fully trained and long-time Deputy Sheriff in Essex County. This was back in the days when if you wanted to be a Deputy Sheriff you went to school 4 nights a week for 3 years and took all sorts of police and legal training. You got a sheriff’s seal for your car because you earned it. He was licensed to carry and did---a snub-nose, .38 police special. He called it his “pistola”; and it kicked like a mule. He and other law enforcement friends, and the members of our neighborhood social club, protected the walkers and the many donations to the Saint. His trusty “pistola” was carried in a belt holster inside his sport coat. As October comes around every year, I think of how Dad prepared for the walk…….remembering the stories of woman praying and singing along with the procession as it made its way through the old Little Italy section near the Cathedral. Many women walked barefooted in sacrifice—praying, chanting, crying for loved ones along the route. There were regular stops along the procession route for the walkers and statue carriers to refresh themselves with coffee and pastries. It usually took the better part of a day for the event to be held. A number of years ago, I faced a serious operation and Dad was determined to make sure St. Gerard was there. The night before the surgery Dad pinned a St. Gerard medal on my hospital gown while the doctors were visiting with me. They immediately became concerned about the medal not being sterile in the operating room. That's all Dad had to hear. His face became blank and threatening, warning them in no uncertain terms, "If my son comes out of that operating room and I find that St. Gerard is not where I put him, you’ll all be sterile after I finish operating on each of you myself !" Like I said, don't mess with St. Gerard. When I awoke, Dad and St. Gerard were both there. And I had nothing worse than a good scare. To this day, on the top shelf of my office desk at home sits my St. Gerard statue, that pin Dad had put on my hospital gown, and the wristband I wore in the hospital. It's a reminder of a close call, and the two guys who were there for me. When our beloved family dog died, Dad put his leash containing all his dog tags around the base of our St. Gerard statue, and there it stayed, never to be moved. Now, Dad's with St. Gerard, and the dog…..probably having a little coffee and pastry with the boys, with a front row seat for the procession.